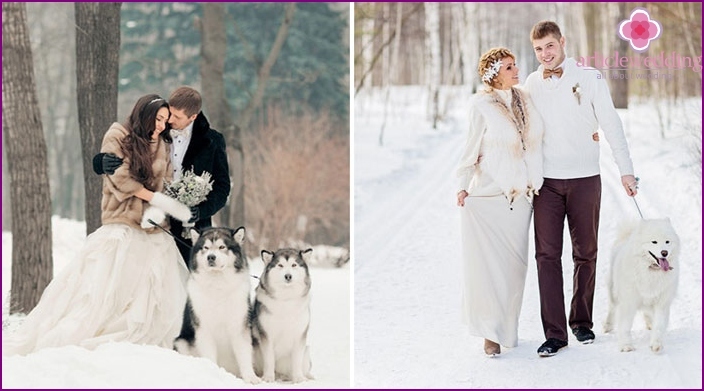 Russian snowy winter - is the perfect time forwedding photo shoot, no matter how you tried to convince thermophilic relatives or friends. The cold season means nuances, but with the proper training of the young will be able to easily avoid frozen fingers and red noses. One has only to take a responsible approach to the conduct of a winter wedding photo shoot. The result is a fabulously beautiful photos with incredible atmosphere, which can not be found in the photo taken in any other season. Unconventional, creative person seeking tohold a celebration unusual by selecting the custom setting. Winter for such young - it's the perfect time. Snow season lets add variety to the wedding feast, hold a photo shoot, which will remain after the stunning, original pictures. Sparkling light snow, wrapped with frost filigree trees, bright sun create a romantic mood, become a successful basis for unusual wedding photoset young. With well-chosen warmingaccessories bride and groom will be able to spend a winter photo shoot in a cozy, comfortable environment for yourself, even if it is accompanied by severe frost or snow. We offer you some interesting ideas for the organization of the Winter wedding photo shoot, as well as give tips for unusual shooting, which will leave incredible memories of the holiday. Horses - it's very noble, kind animals. It is difficult to find a person indifferent to these wonderful creatures. For a long time people have collaborated intimately with the horses, they helped us to quickly overcome long distances. Unfortunately or fortunately, cars replace these animals. But its relevance is not lost the idea of ​​a wedding photo session with horses. Do not doubt that winter wedding shootinginvolving noble animals will not leave anyone indifferent. 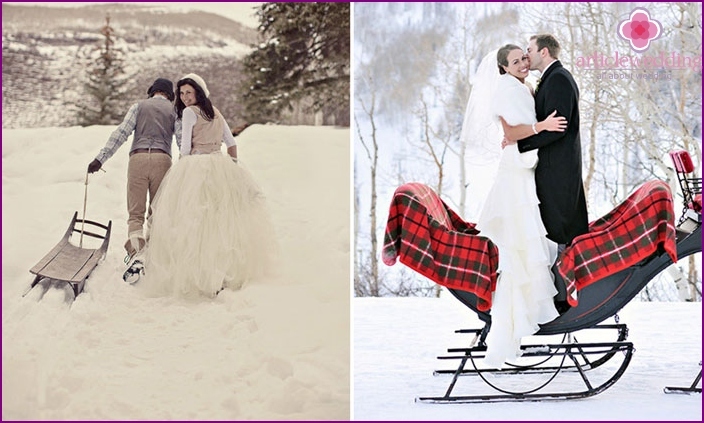 It does not matter that the young choose: horseback riding on the snow drifts, visiting a farm and the organization of thematic photoset, or hire a real Russian three with sled and sleigh - every idea has great potential for creating unusual winter wedding pictures. If lucky enough to young and on your wedding daySnow will -fotosessiya must necessarily pass on the street. More romantic, fairy-tale images and can not be. Let the bride is not concerned about his dress, the snow did not spoil. To shoot the young can choose a more playful mood, which stock up on hats with earflaps, rough boots, fur vest, sled. During the photo shoot can play snowballs or making a snowman. The special charm of the images of the young will give a fun details, like knitted mittens or bright scarf tied to the snowman. Why not pay tribute to the young their culture andnot organize a wedding photo session with Russian native attributes? Cover the table in the middle of a snow-covered field, decorate it with a bright tablecloth, and put at the head of shining samovar and bagels. Entourage in Russian style will complement a properly fitted dress the bride and groom: warm colorful headscarf bride costume with ethnic motifs on the young. Bring a blanket - in freezing weather, he will bring warmth and comfort, not only you but also your photos. Do you have the courage to go down to thesleigh with snow hill? It's a lot of fun, besides the person in the frame will be so alive and happy that the pictures will envy the most picky friend. On the walk, if desired, it is necessary to take friends - so the process will be even more fun. If the adrenaline - this is not what you would get from the wedding photo shoot, you can organize a peaceful, romantic pictures with sleigh in the winter beautiful forest. Wedding photo session in a snowy forest - itthe ideal basis for creating a romantic, gentle image of the bride and the young in general. Clear blue sky, bright winter sun barely breaks through the trees powdered white snow spreading branches of trees, a lovely couple in love - everything looks natural and beautiful. Newlyweds, radiating happiness and love will remain one on one with each other on the background of beautiful nature. Can you imagine how beautiful against the backdrop of the snowHusky landscape look? Etaporoda makes the photo more vivid and saturated. For the bride and groom photo shoot will be twice as enjoyable and fun, if it will take part husky. Favorite pets can decorate any picture, even a wedding theme. And it's nice to hold such an important day for you next to the faithful four-legged friend. Winter wedding photos with the dog will have no competitors, because more beautiful and original images to be found. Wedding photo shoot in the winter - the onlythe ability to effortlessly obtain such magical and unusual images. Against the backdrop of sparkling white snow, any item saturated color, be it a scarf, gloves or a clutch, easy to make photos "live" and will attract the attention of viewers. Traditionally used different shades of red or brown: red, burgundy, the color of cinnamon or coffee. These details in the picture look nice and cozy. Properly selected colors for the weddingphoto shoot in the winter - a guarantee of good pictures. If you decide to organize a shooting outside, you should take care about the accessories that complement your images will contrast with the white snowy landscape. Newlyweds can pick up for a photo shoot quieter tones: brown, dark green or rich blue. Or do they want to bring in the footage more positive and fun by orange, pink, yellow. Would be great if young dilute environmentalsnow white colorful accents. It may be cute mittens with hearts and the initials of a loved one, unusual hats, fine coat from natural or artificial fur. For the wedding photo shoot is not so important, what are the objects around you, the main role is given to mood. Your eyes should light up with happiness, the soul - to sing, and her cheeks hurt from laughing. Only then winter wedding pictures turn out successful, and you may want to review them again and again.